I didn't know Nail Art Stamping is so much fun!!! 2 pieces of metal plates (Random designs). 1 stamper and 1 scaraper. The kit is fairly simple to use. It just took practice, practice and practice. Despite the smaller size of the plates, the actual images stamped really very well. I was surprised to see how the stamping polishes settled into the designs, how they picked up the designs and they scrap off nicely too. Overall the plates are very nice and made of a good steel. In my opinion they are a fantastic dupe of Konad stamping plates. The scarpper was of the plastic and gave a real hard time. It left streaks of polish that we so thick that it can transfer to the stamper and then on the nails - not so good. The stamper is amazing though. It's of a normal size and the rubber end picked up the image and transferred it on nails pretty well. It has super short handle but absolutely have no problem in using it although it looks super cute. Ok!!! This is the least something I was expexcting but to my surprise they worked like a charm for me. They were quite opaque and pigmented enough to be stamped on nails. Still I'm not happy with my effort and I know I need to do A LOT of practice but I enjoy doing it now as I can customize designs and patterns according to my own mood and taste but oh well!! still there's a room left for improvement. You are a fan of nail art. You don't want to invest in higher brands nail art stamping kits. You want to have wide range of nail art to choose from. You are not into nail art. You may find it hassle. You like to select stamping palette of your own. Stamping Metal Plate Nail Art Kit 8.77$ and can be purchase from there website here. The price is extremely affordable in my opinion as if you have been thinking or crazy about stamping/nail art but have not yet invested in Konad or other expensive nail art kits it's a better and cheaper alternative way to get your hands on as Born Pretty store has a wide range of nail art goods to select from. 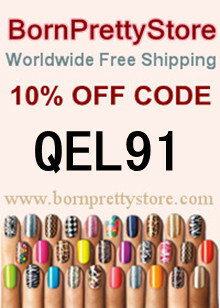 You can also availe 10% amazing discount using code QEL91 with Free World Wide Shipping . What do you think about it ? Are you a nail art fan ? 11 comments on "Born Pretty Nail Art Stamping Kit [Review]"
At least the end result turned out to be real pretty :) Particularly the ones with just the top coat. i am not a nail art fanatic so i have tried stamping kits yet but after seeing your review i think i should give it a go! 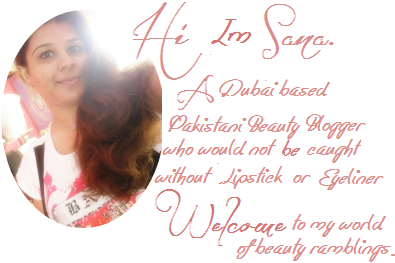 would love if you'd stop by my blog! This is really cool! The results came out so pretty.